Taste of Bethesda 2010 - October 2nd! Come sample from 50 restaurants and check out four stages of live entertainment! Each year, more than 40,000 people attend! Fun for kids and dogs too. Admission is free. Taste tickets will be sold on-site in bundles of four tickets for $5. Food servings cost one to four tickets. Met up with some old family friends for dinner. 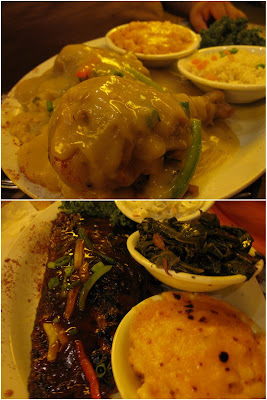 We try to go every couple months and this time it was for time some Southern soul food at The Carolina Kitchen. The first time I had eaten their food was when I was in high school. Their original location was in downtown Silver Spring, but a fire had destroyed the entire strip of shops they were on. Located in University Town Center, there is garage parking (1st 2 hrs are free). The closet metro is Prince George's Plaza on the green line. Right when you walk in you see their 'Take Out' counter. It's really awesome because you can either dine-in or go through the line and take food to go! Even if you're dining in, you can walk through the line to help you make your decision. The decor is beautiful. I think it's New Orleans meets Harlem Renaissance. The high ceilings, attention to detail, and warm colors are very inviting. Look how cute the water glasses are! I love the idea of the mason jars. Our group of 5 shared a few appetizers. The 'Cheese & Bacon Cajun Fries (Golden fries with Cajun seasoning loaded with melted cheese and bacon)' for $6.49 were so good and cheesy! Top: Spicy Thai Chili Wings (Covered with our sweet and tangy Thai Chili sauce)' for $8.99. My favorite out of the two because they were sweet. 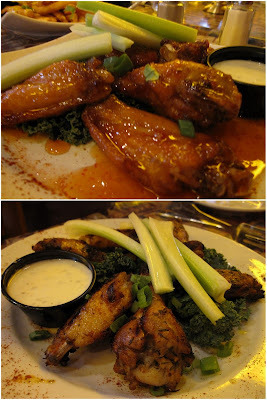 Bottom: Grilled Jerk Wings (Slow cooked grilled wings with spicy Jerk seasoning)' for $8.99. The table's favorite, but too spicy for me. The BEST cornbread I've ever had in my life. They were thick portions topped with honey butter, and just so light. They come with your main meal, and I know I could've just eaten a whole tray of it by myself. Top: Smothered Fried Chicken (Two pieces of fried chicken covered in grandma's gravy over fresh garlic mashed potatoes and two side fixins)'for $14.99. This gravy was very thick and creamy. Bottom: Grilled Baby Back Ribs (Slow cooked, tender grilled pork ribs, basted with Carolina Kitchen's "award winning" BBQ sauce with baked beans, homemade coleslaw and Cajun fries, half rack)' for $15.99. The meat was falling off the bone and very tender. The bf ordered the 'Cajun Grilled Pork Chops (Two flame grilled, tender pork chops with zesty Cajun seasoning served with rice pilaf, macaroni & cheese and classic vegetable blend)' for $14.99. He enjoyed it a lot! I was IN LOVE with the collared greens he got. I will be getting those next time! I ordered the 'Rotisserie BBQ chicken' for $11.99. I got the Mac & Cheese and Candied Yams as my side. The Mac & Cheese was a table favorite too! Thick and cheesy. The yams had more cinnamon and orange flavor than I usually like, but the men at the table liked them. The service was very friendly and helpful! The food came out in huge portions, and there is a large menu to choose from. Most of their main entrees range between $11-15, with some of their seafood platters being more. If you're there for your birthday, they sing a really cool song to you! They offer karaoke nights and reggae nights too during the week. If I moved to NYC, I'd be fat and broke. NYC is one of those cities that I fall in love with every time I go. Granted sometimes its dirty, too crowded, expensive or hectic, but I love the food, the tall buildings, the accent and the excitement. I took a weekend trip for a bboy battle, and to visit some friends. It's a different trip when you visit friends because you rely on them to show you around. Compared to my LA trip where I was researching 6 months prior on where to eat and visit, this NYC trip was relaxing and my friends did a great job showing me as locals, where they loved to eat. I got to NYC for $1 on Gotobus.com. With all bad weather recently, I didn't get to NYC until around 10:30pm. My girl NV picked me up, asked if I was hungry and said "I know exactly where to take you". I haven't had a Philly cheesesteak in months, so I was happy to try a new place. FYI, it's cash only. Like many places in NYC, they're tiny. This place had around 5 small tables. Very casual but looked cool with the red lighting. Order up front, and they'll call your name. You can also place your order online. I ordered the 'Steak, American cheese, Wit' (onions) and green peppers' for $8. Cheesesteaks come in one size (12 inches) and they're skinny. It was really good, and I ate the entire thing! Very soft sandwich, and the meat wasn't dry at all. OMG these were the BEST waffle fries ($3) I've ever had in my life. They were hot, crispy, flavorful, and soft on the inside. You don't even need to dip them in anything, but their BBQ is really delicious. I met up with my long time friend Hank for lunch and walking around the city. He took me to one of his favorite, and healthy Japanese restaurants. It is a macrobiotic (the thought that by eating balanced foods such as grains and vegetables that are more local and in season), organic and natural restaurant. Skinny little place that was SO tranquil on the inside. It makes you forget you're in a bustling city. I ordered the 'Stir-fried Soba (sauteed vegetables with soba noodles in teriyaki and ginger-tamari sauce)' for $11. It was a large portion of a lot of vegetables and it was a bit bland, but with the soy sauce and sesame seeds, it was pretty good. My friend ordered off their specials menu: pick a ramen and a side for $10. He ordered the 'House-made Curry Ramen (curry spices and vegetables with organic wheat noodles) and the 'Sauteed Garlic Greens (kale) with Sesame Vinaigrette'. The ramen was flavorful because of the curry base and the kale was yummy. For dessert we shared a 'New York Tofu “Cheese cake” Pie (light and glazed with berry sauce)' for $6.50. It was better than it sounds, and it was thicker and less creamy than a traditional cheesecake. It can't compare to a traditional NY Cheesecake, but if you're lactose intolerant, its a good alternative. Right after we ate at Souen, we walked past his favorite pizza place, which already had a lot of people sitting outside eating. Tiny place that has no seating, and you buy pizza by the slice for $4.50 each. 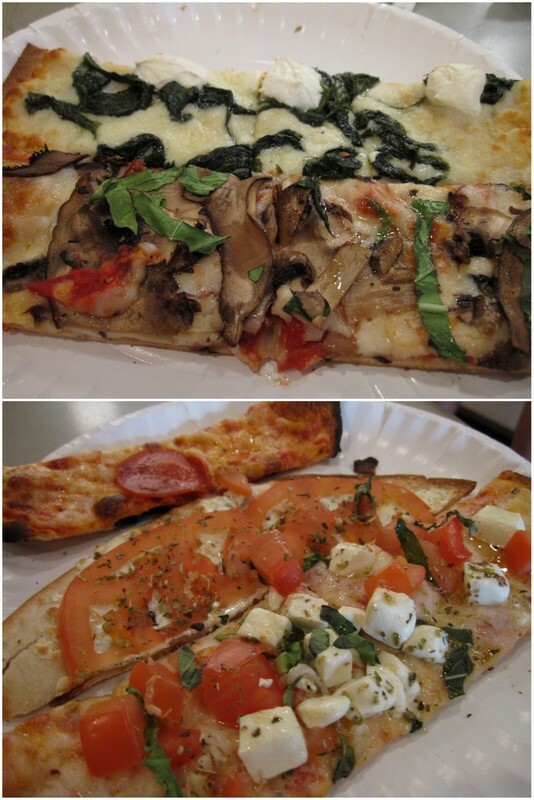 Their specialty is their 'Artichoke pizza (artichoke, alfredo sauce and fresh mozzarella)'. OMG this thing was so good! The sauce was very rich and the dough is more like a flat bread. 53rd and 6th Halal Cart "Chicken and Rice"
Around 3am we hit up the Halal Carts to get Chicken & Rice! The line was 4 times what you see. I prefer the lamb & rice ($6), and OMG if they had this back home, they'd prob get all of my late night snacking money. My girl NV took me to this cool and different pizza place for lunch before practice. Casual place with retro furniture and clean walls and floors. You buy pizza buy weight. It's not announced, but we asked and it's around $9.50 lb (expensive!). You tell them how big of a slice you want to buy. You can taste them before committing. The pizza is very thin, and more on the crisp side. If you wanted to buy an entire pie, you can do that too for a non-weight amount. They were all really good because the ingredients were so fresh and flavorful. I chose a Boyland Soda in Black Cherry as part of my meal deal. It's so good! I wish these kinds of sodas came in 2-liter bottles. The cane sugar really makes the sodas taste more natural. Walking around after practice, and there were so many closed off streets for weekend markets. This is the 1st time I've had frozen yogurt from a truck! It was perfect weather for some froyo. 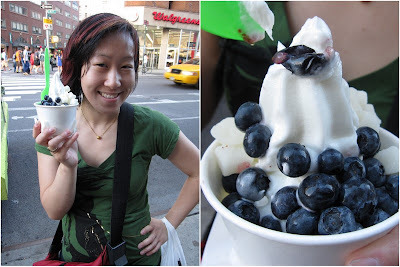 We shared an original tart with mochi and blueberries ($4). It was SO good. The yogurt was dense, tart and creamy. The mochi and blueberries tasted fresh, so I was a happy camper. It was my last day, by NV wanted me to try some places before catching my bus, so she showed me her favorite NYC bagel place. They make their own cream cheese in house! Right after we ate the bagel, we drove to get mini burgers as part of my last meal. Look are COOL this place looks! Casual place where you order at a window, and pick up your order. You can also order online. 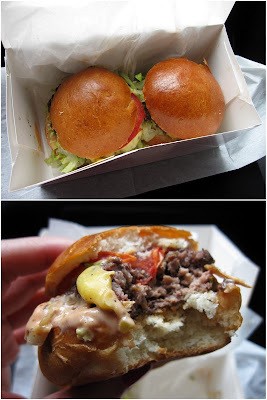 Their speciality are their 'Pop burgers (burger, American cheese, lettuce, tomato, and Pop sauce )' for $7. You get 2 in a box, and they're super tasty. The Pop sauce reminds me of McD's Big Mac sauce. Very fresh ingredients, and I really enjoyed them. We shared an order of fries ($3.75), which were so good! I didn't need ketchup on these either. They were crispy on the outside (more similar to beer battered fries) and soft on the inside. I heart my friends so much, the battle was fun, and I can't wait to go back! I haven't cooked in so long! (wifey material? ha...) The bf's mom gave me 2 potatoes and a packet of curry, so I decided to make a huge pot of it to last the week. If you haven't had Japanese/Korean curry, it's so good. It's smells amazing, and it's not too spicy. The sauce is thick and tastes very warm and comforting. I'm not sure what makes it either Japanese or Korean, because they look exactly the same to me. It's one of the easiest things to make! These are the ingredients I used, you can mix it up and add whatever you'd like. A Little Bit Of Evrything likes to put garlic and jalapenos in hers, so it's all your preference. Start by boiling 6 cups of water because it can take a while. Chop the onions, potatoes and carrots. You want all of the ingredients to be around the same size. That helps them cook more evenly. So I cut them around the size of the beef chunks. Cook the beef in a pan until they are cooked through. The box said to cook the onions and beef together, but my pan isn't large enough. Then I cooked the onions until they were slightly transparent. 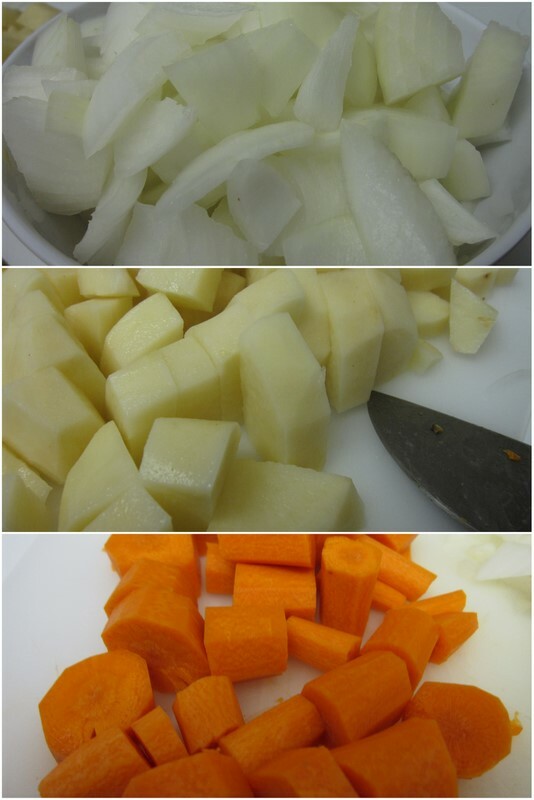 Throw the cooked beef, cooked onions, potatoes and carrots into the pot of boiling water! The curry packet comes in a pack of 2. I like my curry flavorful, so I threw the entire box in (2 packets). You can choose to use less and just refrigerate the unused portions. Stir so the curry block melts, then simmer with a lid for about 15 minutes. Look how much it makes! Serve over short grain rice, and chow down!